Last week I had the opportunity to meet a few of my gal pals for lunch and I was just thrilled about it. Darla and Dana met me at my favorite out of the way restaurant, Cafe Firenze in Moorpark. They had never been so I was happy to share with them the goodness of Fabio from Top Chef. I arrived to the destination first so I got first dibs of the focaccia and marinara. Such a lovely start to any meal! 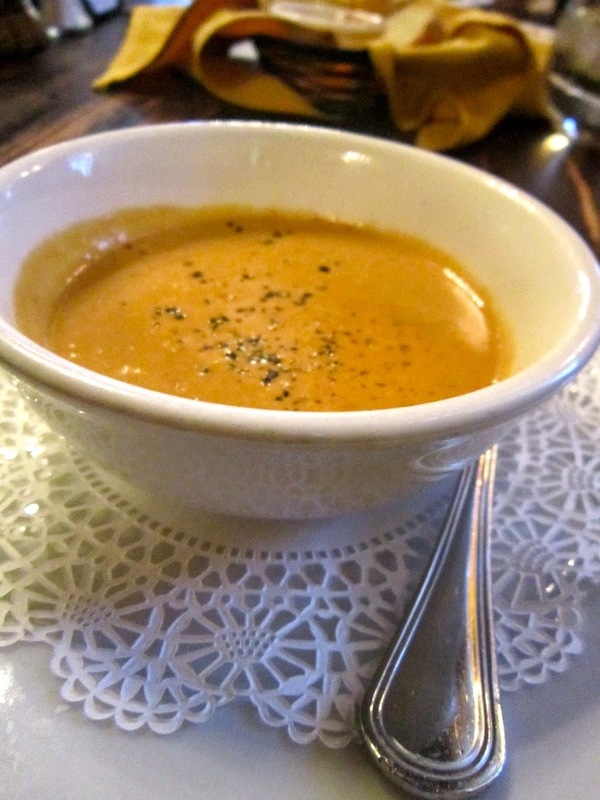 I have been denying myself the pure joy of Lobster Bisque as of late so when I saw it on the menu I knew that is exactly what I wanted. I started my meal with the liquid gold and I practically licked the bowl clean. There are not actual chunks of lobster but it is heavily saturated with the flavor. I followed my creamy bowl of soup with another creamy concoction, Butternut Tortellacci. It is wonderfully filling almost to the point of button popping exhaustion but worth every calorie. If I had to critique the dish the dough on the pasta was quite thick. If it was a smidge thinner it would have been a more pleasant mouth feel. The fried sage is always my favorite. I try to get a piece in every forkful. Dana went the pizza route and ordered the Arugula and Prosciutto pie and it was totally amazing. I never crave pizza the way she does but if I did, it would be this type of pizza. I like the saltiness of the prosciutto, freshness of the arugula and the crust was perfectly crisp and could standup to the ingredients on top. Lastly, Darla ordered the Filet Mignon Sandwisch special and it was filled with steak, arugula, horseradish creme and served on focaccia. It was a tasty sandwich as Darla sliced off a bite for me. I appreciated that they left the steak medium rare, usually sandwiches are filled with meat that had maybe been over cooked. Great sandwich. I loved this day at Cafe Firenze. It is perfect for lunch and also romantic enough for a date night out. I look forward to coupling up and inviting a possee to share an evening out with our husbands... They deserve the great food of Cafe Firenze as well!